Hello there bloggies! Welcome to this week’s Wishful Wednesday! Get ready, get set, it’s time for another biweekly book writing update! I am ever so close to wrapping up the first draft of Deluded. I only have a couple thousand words left to go. If I didn’t get bogged down by the blasted cold this week, I think I could have finished it up. The last major plot development has occurred. I needed to put the end of the story together and hopefully leave the reader how I want to leave them. My goal is that by the next book update I will have a finished first draft and a sample of it for you all here on the blog. The status of The Collective is more or less the same: waiting on news from agencies I have submitted it to. I have gotten a few rejections so far, which I had been anticipating. The notes were quite nice, but still were passes. I am hopeful more positive news will come in the future! I may send it out to a few more agents this weekend. Hey, got to keep at it! 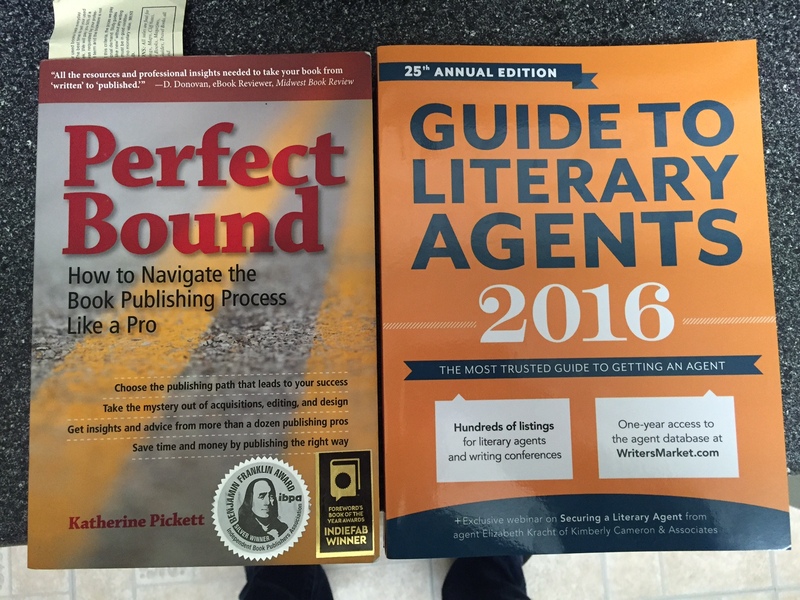 These books are Perfect Bound by Katherine Pickett and Guide to Literary Agents 2016 by Chuck Sambuchino and Writer’s Digest. Both walk new writers through the process of trying to publish or self-publish their literary work. As a newbie to this area, both have been so so helpful. They explain the jargon and nuances of querying agents, how to research your genre, and what to expect should your book make it past the agent query phase (still hopeful!). The most valuable parts are the examples they include and insight from authors who have gone through the process before. Not only that, but Guide to Literary Agents 2016 has a database of agencies and agents to help focus your agent search. I’m still so early in the query process for The Collective and still a few revisions away from even thinking about querying Deluded. But, these books plus their associated web resources will set me on the right way to fully exploring this crazy writing endeavor of mine. Thank goodness I have a day job to still with. Thank you for checking out this book writing update on Wishful Wednesday! Authors, what resources are invaluable to your writing and publishing? Share them below or on twitter @DrFsThoughts. Previous Previous post: Trainee Tuesday: How often do you meet with your PI?